Four days after he was deported from the U.S. to Cambodia, Soeun Chheng bought new barber’s shears, electric clippers, a straight-edge razor and a barber’s cape from shops near Phsar O’Russei in Phnom Penh. He was surprised how inexpensive the items were—about $45 in total. Back in Willmar, Minnesota, where he lived until two weeks ago, Mr. Chheng—whom everyone calls “Posy”—was a barber working in a friend’s shop. Now in Cambodia, Posy says he plans to continue practicing his craft in his new surroundings. “I feel more comfortable when I have clippers in my hands,” he said. For some recently deported Cambodians, like Posy, who came of age in the U.S., their repatriation to a country in which many have few family members or cultural connections has made them examine their own identity and the idea of home. In the U.S., Posy has a wife and a newborn son. He’s unaware of any extended family in Cambodia. His parents fled the country as refugees and he was born in a Thai refugee camp in 1981. His family immigrated to the U.S. when he was nearly 5, after spending eight months in the Philippines. Posy had never stepped foot in Cambodia before May 3, when he exited a chartered airplane into the Phnom Penh heat with seven other Cambodians, who had also been deported by the U.S. Department of Homeland Security after serving prison sentences. Despite having Cambodian names and Khmer heritage, deportees say they feel out of place in their new environment. For all of them, deportation means separation from their families and an American way of life, causing hardships at home and in Cambodia. Posy is one of a high-profile group of eight Cambodians from Minnesota who were detained by U.S. immigration authorities in August and whose families and advocates rallied in an effort to halt their deportations. Five of the “Minnesota 8” were deported in the last two months, one was released from U.S. Immigration and Customs Enforcement (ICE) detention in February and two remain in ICE custody. Posy’s sisters and mother have been rallying on his behalf. His younger sister, Nancy Chheng, says they went to rallies and took turns attending organizing meetings. “We were on the news a couple times,” she said. But it didn’t stop her brother’s deportation. In the past 15 years, more than 560 Cambodians have been deported from the U.S. to Cambodia—including seven who were repatriated this week—as a result of past felony convictions. The deportations are allowed under a 2002 repatriation agreement between Cambodia and the U.S., which the Cambodian government has repeatedly said it wants to renegotiate in order to lessen the hardships on the families. Under current U.S. laws, for a non-citizen with a felony conviction, “deportation is mandatory. 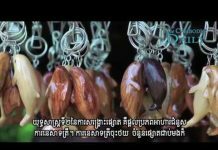 It’s not something that a judge decides,” said Bill Herod, founder and adviser to the NGO Returnee Integration Support Center (RISC), which helps deportees adjust to life in Cambodia. Becoming U.S. citizens would have prevented their deportations. But Cambodian refugees often didn’t gain citizenship as children because their parents may have feared interactions with government officials due to their experiences under the Khmer Rouge regime, leaving both parents and children without such status, Mr. Herod said. In addition, if non-citizens are convicted of felonies as minors, they are usually ineligible for U.S. citizenship. And some non-citizens convicted of felonies are picked up by ICE straight after being released from prison. A Cambodian may be out of prison for years and “live a perfectly normal life” and then get detained by ICE during a routine check-in with immigration authorities, Mr. Herod said. “These people were just thrown in big cities and left to survive as best they could,” with some joining gangs as a means of survival, he said. Posy’s personal history reflects a common narrative of deported Cambodians. He served more than 17 years in prison, earning a high school diploma and barber apprentice certification. During the four years between his release and detention by ICE last year, Posy said, he worked in a Willmar barbershop owned by friend Steve Peppin whom he met in prison when they were teenagers. He worked six 10-hour days a week during his first year at Pep’s Barber Shop, he said. “That was a way for me to integrate into the community and to make friends,” he said. When he got out of prison, he believed he had reformed himself. Posy said he thinks that he’ll eventually adapt to living in Cambodia, although he doesn’t speak much Khmer and is living in shared housing provided by RISC, which is funded by USAID and the Mennonite Central Committee, a Christian NGO. Posy’s family and friends in the U.S. have been sending some money, and the men living together in RISC housing chip in to buy food, he said. His deportation has been even harder for those he left behind in the U.S.
“The day we left I couldn’t stop thinking about my family,” he said. The thought of his wife, Allison, having to raise their son alone was particularly difficult. When she went into labor in late April in Minnesota, Posy said he tried to stay on the telephone with her as long as he could from an ICE detention facility in Arizona, missing the birth by 30 minutes. When his son, Jakobie, came into the world on April 27, Posy was about 2,400 km away waiting to be told when he would fly out of the country. He has only seen him in photographs and via online video chats. “I have not been able to hold my son at all,” Posy said. Back in Minnesota, his wife Allison, 23, says that her husband’s deportation has put stress on her family. The oldest son in a family of four children, Posy said his mother and siblings are “more worried about me and I’m worried about them.” His father died in 2004. His youngest sister, Nancy Chheng, 24, is very close with her brother, but she worries that their bond will weaken as a result of distance. “When he was still here we talked every day and hung out almost every weekend,” she said. Now, they speak less often over social media. When he was detained by ICE in August, she became stressed and decided to drop a class in her associate’s degree program. Their mother, Mon Lem, 60, who works as a hotel housekeeper, is taking Posy’s deportation the hardest, she said. “When she fled the war, he was with her [in the refugee camp]. She brought him to the U.S. to live a better life. And now he’s gone to a place she fled from,” Nancy said. Ms. Lem said yesterday that she thought her son’s deportation was “inappropriate” because he had already served a long prison sentence for his crime. “He was imprisoned for many years and after having been released, I was hoping that he would be reunited with us, but he was still deported,” Ms. Lem said. “I want my son to come back to see his wife, child and mother, but I don’t know what to do,” she said. Posy’s wedding in August was a joyous occasion for the family. Then the news came, just weeks later, that he was getting deported. “It just tore everybody apart,” his sister said. His comments followed similar statements from officials over the course of months—including some who said deportations should be made voluntary. In October, the Foreign Affairs Ministry sent a letter to the U.S. Embassy in Phnom Penh asking the U.S. to temporarily halt deportations until the agreement could be renegotiated. 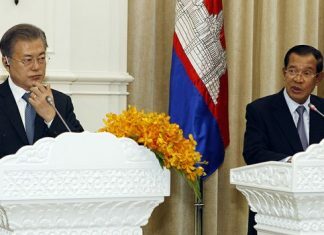 Two months later, a U.S. Embassy spokesman said the agreement remained “in force and unchanged” and earlier this month, the U.S. told Cambodia to continue accepting Cambodian citizens for repatriation, Foreign Minister Prak Sohkonn said following meetings with U.S. officials in Washington. U.S. Embassy spokesman Jay Raman reiterated earlier statements this week, saying that Cambodia had informed the embassy of “its desire to renegotiate certain aspects” of the agreement. Like Posy’s son, who was born days before he was deported, Phal Nop’s daughter was born seven months ago while he was locked up in an ICE detention facility. “I haven’t even held her,” Mr. Nop, 37, said this week in Phnom Penh after being deported about a month ago. Born in Cambodia, Mr. Nop fled to a Thai refugee camp and then to the U.S. as a child with his family. He has lived in Atlanta for more than 30 years and speaks with a Southern accent. After serving four separate prison stints in the U.S.—arrested first at 16 for stealing cars—he is trying to make the best of a difficult situation. He plans to seize new opportunities in the country and looks forward to having his wife and children join him in Cambodia. Blanca Nop, his wife, said she has struggled financially since her husband was detained and deported, but she is also trying to stay positive and look to the future. “If he was here, it would be different. We would have things and everything that we need,” Ms. Nop, 42, said this week, adding that donated baby clothes, diapers and other necessities have helped since her husband was detained. She plans to move with her three youngest children to Cambodia in order to live with her husband and work as an English teacher and missionary, she said from her home in Tennessee. For her husband, Cambodia is not home yet. The day after Posy purchased his new tools of the trade, he gave his first haircut in Cambodia. His first customer was Mr. Herod from the Returnee Integration Support Center. “I paid 10,000 riel [about $2.50] and suggested he put it on display in his shop when he gets settled,” Mr. Herod said. Posy says he would love to start his own barbershop in his parents’ homeland. “I have all the right tools for it. I’m ready now, but it’s a process so I’m hoping that one day I will have something up and running,” he said. 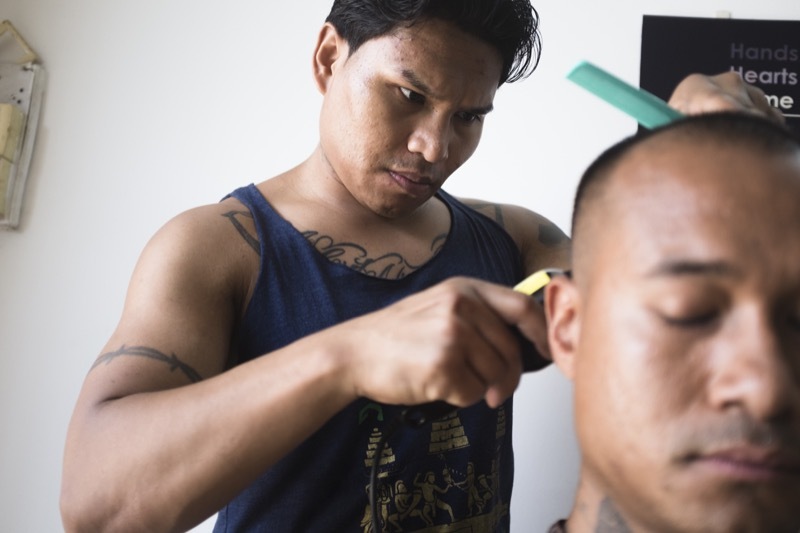 Meanwhile, he is keeping busy, having given haircuts to a half-dozen other Cambodians who have been deported, including Sarim Khleung of California, who arrived the same day as Posy and feels lost in his new surroundings. “Right now, everything is just too much for me,” Mr. Khleung said. “I do speak Khmer, but the way they speak over here is just way different from the way I speak,” he said. When he tries to talk to locals, he mixes English and Khmer and gets stares because of his tattoos and clothing. “I think I’m Cambodian, but they say I’m American,” said Mr. Khleung, 34, who was born in a Thai refugee camp and went to the U.S. when he was 2 years old. Since arriving, he feels more American, but now considers himself Cambodian. “I try to be a local, fit in as a local,” he said. Of the 566 people deported from the U.S. since 2002, about 160 people had no identified relatives in Cambodia when they arrived, at least 12 had a disability and at least 26 have died, RISC said. Mr. Herod said at least six of the deaths were likely suicides. Some end up back behind bars. As of this week, there were 14 Cambodians incarcerated in local prisons for crimes committed in Cambodia after being deported from the U.S., according to RISC. For Posy, knowing that his deportation was “by force and not choice” weighs heavily on him. When he landed in the country, he thought about how he would adjust and eventually call Cambodia home. Now, when he looks out the window or is woken up by a rooster instead of an alarm clock, he’s reminded again of the fact that he is not home.